Elegant and charming cottage with overwhelming views of Siena, next to an 18th century villa, summer residence of the English poet Lord Byron. Renovated to the highest standards, the cottage is located on a hilll facing the town, at only 5 minutes drive from the famous Piazza del Campo. A bus stop is just 30 meters far from the cottage and will drive you to the city center in only 10/15 minutes (every 30 minutes). The classical interior design is in keeping with the typical Italian tradition. The magnificent bookshelves and fireplace give the living room a warm and cozy family feel, enhanced by the wooden beamed ceilings. The big wooden framed windows give an enchanting luminosity to the large and welcoming living area. It is provided with two comfortable armchairs and a couch, a flat screen TV and a diner table. The living area leads up to a fully equipped and functional modern kitchen with a unique chandelier. Every window opens to splendid views of the Tuscan countryside. The cottage has two bedrooms (the master bedroom and the studio with a sofa bed that offers an orthopedically mattress 200x160 cm), both spacious and charming with wooden parquet floor and beamed ceilings and their respective en suite bathroom. The cottage offers luxury features such as an infrared sauna, one of the “hottest” home wellness therapies. Unlike traditional saunas, which operate at extremely harsh temperatures, infrared is a gentle, soothing and therapeutic heat that promotes relaxation and improved sleep. 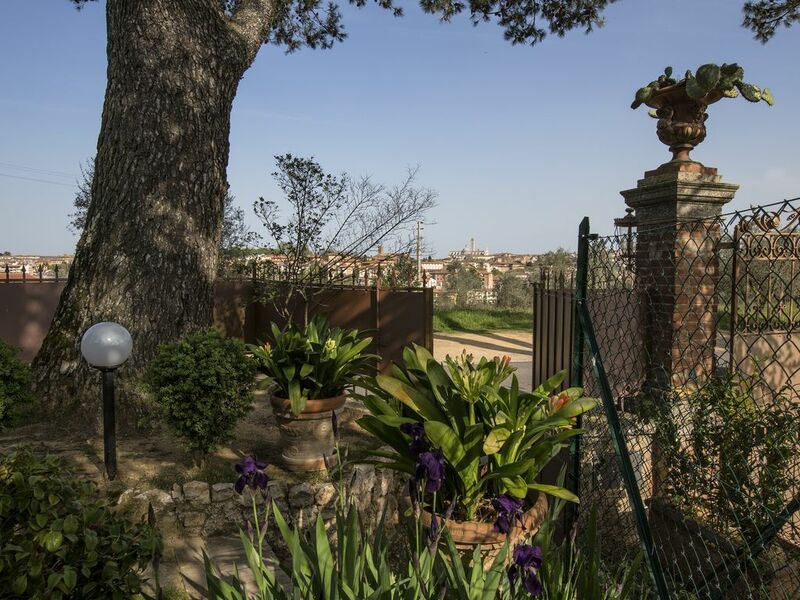 You will also find at your disposal a private garage with an elevator that will carry you and your luggage directly to a sunny and welcoming garden with bright and enchanting views over Siena and to the cottage. There is free Internet access (WiFi) available in the apartment. Our rate includes: linen and towels and utilities (the floor heating has to be paid extra by reading a dedicated counter: euro 30/per day). Every window is provided with mosquito net. Prior to the cottage the property was a winter storage for the Villas's Lemon trees. It has very thick stone walls and the interior thermal isolation together with the double glazed windows makes the cottage stay comfortably cool throughout the summer without air conditioning. No effort has been spared for you to spend the most enjoyable stay. In each and every season the ideal location for your dream day trips in Tuscany! The cottage is ideal for a couple or two wishing to enjoy the Tuscan dolce vita. If you love wine, take a tour to the Chianti wineries and stop to eat in authentic restaurant, experience unique shopping or take a relaxing bath in the hot water springs, play a round of golf or rent a bicycle. The Cappuccini Luxury Siena is an exclusive and very well located spot to make your Tuscany holiday a dream come true. Hello my name is Agostino. I am an engineer and a lawyer and because of my job I travelled very much. I love travelling and meet new people, discover new countries and taste different cultures. I travelled through most of the continents , and they all fascinated me. I always try to understand local habits and enjoy tasting the local cuisine, Asian and Japanese are my favourite. I like sports: tennis, soccer, riding, skiing, cycling, swimming and golf is my favorite one. Nothing is more exciting than travelling and meeting new people so I will be happy to welcome you in one of the most beautiful region of Italy, welcome in Tuscany! The cottage offers all the features for a perfect holiday, also because of the excellent location. It feels like you are in the middle of the Tuscany country side and yet if you take the bus you are just 10 minutes away from the Siena city center. Towels and bathrobe are provided. They are also extra towels and bathrobe for the use of the Sauna. You can choose where to dine, whether outside in the garden terrace or in the living room or simply have a quick meal in the kitchen. The sauna is outside the house, in the garden terrace. It has a shower, special towels and bathrobe. The infrared sauna provides soothing and nice therapeutic temperatures ideal for relaxation. Very nice place as described in the pictures. Convenient to Siena or nearby. Arrived and was met by the very nice owner. Place is exactly as described in the description and photo's. Wonderful place. Very nice and enjoyable. Very convenient to any item into Siena or nearby area. A few items of note from other peoples reviews. The owner does have two nice German Shepard dogs. They do bark in the mornings. I am a light sleeper so I always bring ear plugs with me whenever I traveled. This made it so I couldn't hear the dogs. If you rent a car be carful pulling out of the garage as it has a slopped concrete apron. I scrapped the front spoiler on my rental car several times. Would stay at here again. Many thanks for your comments, I can't do anythings for the garage concrete apron. Regarding the dogs they are closed till 8 a.m. and they should not disturb my guests, they are guard dogs for my and your security. Beautiful home, wonderful location and a terrific host. We really enjoyed and loved our stay. From the moment we arrived to the moment we left we felt completely at ease and cared for. The home is absolutely gorgeous and lacks nothing. Such close proximity to Siena (bus stop nearby was great and extremely convenient) with stunning views. Mr. Caltran's property is a perfect Tuscan getaway. He is extremely accommodating and goes out of his way to make it feel like home. I would recommend this to ANYONE. I hope to see you again in my property. This is an exceptional property. The surrounding area and the view out each window we're beyond our expectations. The interior of the property did not disappoint. Each room was tastefully done. Agostino was kind enough to greet us at a very late hour due to unpredictable travel delays. He also provided a booklet of bus tickets that we were able to use on our first trip into Siena. The bus is predictable and easy to use. The caretaker of the property was available for our every need. When a pipe sprung a small leak he was able to get a plumber out and have it fixed within two hours. That doesn't happen very often in America! An amazing highlight was waking up to the Bells from the church in Siena. When you open the window of the master bedroom you have a beautiful view of the Siena City churches and Towers. I will only briefly mention two small negatives. One was occasionally hearing the dog bark in the early morning hours. And the other is a need for a new mattress in the master bedroom. Please do not hesitate to rent this property you will not be disappointed!! I hope to see you again at the cottage. -sorry if my dogs disturbed you but as you know they are guard dogs for your and my safety. -the mattress of the master bedroom is new and is in wool, probably you are non used to wool refill. Magnificent views of Tuscan hills and Siena. Exceeded our expectations. As fellow HomeAway rental owners we appreciate the extras. This newly remodeled cottage has a beautiful view of the owners gardens, Tuscan hills and the city of Siena. Beautifully decorated with a private entrance, a private garage and located across from the city bus stop. Extras include a private patio, sauna and both bedrooms have en suite baths. The owner provides a fully stocked kitchen, coffee, crackers, spices and even wine. The perfect location to drive for day trips to Florence, Cinque Terre or the many wineries and beautiful towns surrounding Siena. Siena is just a short bus ride away for dinner and experiencing this fantastic city. The perfect location to experience living in Italy. Our trip highlight was an e-bike (electric) tour with Fred E-Bike. The owner recommended Fred E-Bike and we couldn't imagine a better way to experience views of Tuscany that can't be seen from a car or bus. We highly recommend this beautiful cottage. The owner is only pleased to have kind guest as Don & Montie Rouse. I hope to have other similar guest. Very beautiful, quiet, comfortable and convenient place to stay just outside of the Siena city walls. We enjoyed the wonderful terrace and full kitchen, with basic ingredients as well as equipment for making meals. We are a couple in our 60s so we didn't need the second bedroom, which is best for kids or lightweight adults as it's a pullout couch. Tito or his onsite assistant checked in on us each day, providing anything we requested. On our arrival, we were provided fruit, cheese and crackers and beverages--welcome for weary travelers. We love this property and hope to be back someday. The dogs will greet you loudly at the gate the first time but they are very friendly and remember you later, so don't be wary. Enjoy life here! INCLUDED IN THE RATE The rental rate includes all energy & water costs during the peak season (however during the winter season the heating will be charged apart at the price of 1.20 euro per cubic meter), the supply of linen and towels( including sauna towels), weekly cleaning costs,consumables ( such as washing Powder & dishwasher tablets). It also includes essential food condiments.There is free Wi Fi.